The Amateur competition is a mixed team/solo event intended as a venue for begining or advanced amateurs and is open to all levels except Masters and Professionals. click here to go directly to the registration form. For questions please (click) here to send an email. Space is limited, online registration guarentees your space. NOTE: This schedule is only for the Sand Sculpting portion of the event. There are many other activites going on during the event. • All work will be done using only the sand in your assigned, 10’ x 10’ plot. • Nothing may be added to the sand except water. • No power equipment, screw guns or machinery are allowed in your plot. • No templates or molds are allowed when sculpting. • Only registered team members are allowed inside of your plot. • All tools and personal items must not block spectator aisles. • Absolutely no glue is allowed. not include anything that would commonly be considered offensive. • Umbrellas, tents or other shade devices may not be used near the sand sculptures. • Anyone working before the start time or after the stop time will be disqualified. • Only water and the sand from within the assigned plots may be used to create the sculptures. shells may be used for decoration. • No artificial color, paint, flour, sugar cement or adhesives of any type may be used. • The decisions of the judges are final. • The start time is 9:00am and the stop time is 12:00pm (3 hours total). Judging will begin promptly at 12:00. • Contestants must provide all their own buckets and shovels, carving tools etc. $15.00 per sculptor. Please click here to fill out the registration form. STEP #1 - Please Complete this form and press the Submit button. STEP #2 Once complete you will be asked to pay for your registration via Pay Pal. 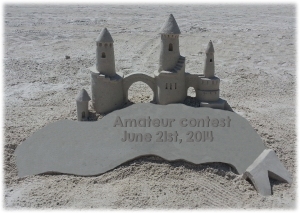 There will be a limitied number of Sand Sculpting plots for this contest. To guarantee your spot please fill out this online registratation form. Registration Fees are $15.00 per person.